Can you confirm these amateur observations of Phymaturus dorsimaculatus? Type locality: Copahue, Dpto. Ñorquin. 37°49’S; 71°06’W. Neuquén, Argentina. Diagnosis Diagnosis (dorsimaculatus): Phymaturus dorsimaculatus belongs to the palluma group (sensu Etheridge, 1995) because it has squareshaped non-imbricate superciliaries, rugose dorsal scales of the tail, usually a fragmented subocular, and the subocular-supralabials separation is two or more scale rows. It is distinguishable from all other species in the group by its unusual dorsal pattern. Dorsal pattern from occiput to the posterior region of trunk with black transverse bands interrupted medially (Figure 1A). Phymaturus verdugo is a larger species (106-120 mm both sexes; Cei & Videla, 2003) than dorsimaculatus (76.1-92.6), has a different dorsal pattern, and a patternless tail (ringed in dorsimaculatus). This new species has a different karyotype number (2n = 36) versus 2n = 26 of P. verdugo (Morando et al., 2001; Cei & Videla, 2003). Adults of cf. palluma (PA) lack melanism on head and neck and all other members of the palluma group have patternless tails. Phymaturus dorsimaculatus never have a divided rostral scale as does many punae, antofagastensis, cf. antofagastensis SC (Sierra de Calalaste and Cuesta de Randolfo), and punae LR (La Rioja). Most specimens from northern Argentina of the palluma group exhibit a homogeneous and dense “spray” pattern on their dorsum (Figure 12C) and lack black reticulation or spots. Comment Synonymy: Depending on author, Phymaturus dorsimaculatus is considered as a synonym of Phymaturus vociferator (Pincheira-Donoso et al. 2008) or as valid species. 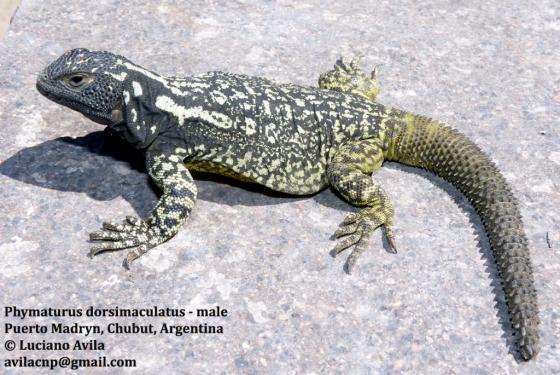 Troncoso-Palacios & Lobo (2012) argue that P. dorsimaculatus is a valid species, given that the second chinshields are separated, a characteristic that together with the vocalization (according to Pincheira-Donoso, 2004) and the scapular black bars fused in the male, allow to differentiate it from P. vociferator. Group: palluma group (fide LOBO et al. 2010). Etymology Etymology (dorsimaculatus): The epithet refers to the conspicuous pattern of black spots over the neck, shoulders, and dorsum of the trunk of this new species. It is a compound name (originated from two latin words dorsum that means back and macula that means spot, mark).